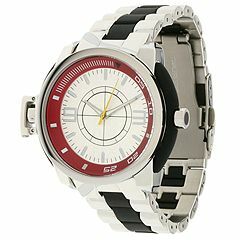 This rugged yet sophisticated D&G watch has a very jet-setter feel. Stainless steel case and band. Three hand analog quartz movement with glow-in-the-dark hour and minute hands. Rotating ratcheted bezel for set time keeping. Fold-over clasp with push button closure. Water resistant to 10ATM. Comes in a leather gift pouch. Two year limited manufacturer's warranty.